I have an embarrassing confession.Â I picked up this book on a recommendation from a friend.Â He told me that I would like the content and could use it myself and write about it.Â I purchased The Power of Less thinking it was a book about frugality and minimalism.Â Boy, was I egg-faced when I received it in the mail and realized that it is authored by Leo Babauta, the mastermind behind Zen Habits.Â If you are unfamiliar, Zen Habits is a truly AMAZING website focusing on productivity and achieving goals among many other subjects.Â It is one of the top 100 blogs on the Internet.Â If you have never been, you are sheltered and should put away at least 13 hours per day to read and enjoy the site.Â One simple glance at The Power of Less let me know that my assumption about it’s content was way off. I was sucked into this book pretty quickly.Â There are some repeat ideas, but all of them are simple to follow and even easier to implement.Â You will likely have two choices on how to ingest this material. 1) Keep it handy for encouragement and read small bits at a time. This is my preferred method for ingesting Leo’s ideas.Â I find it energizing and encouraging to turn to these pages when I need a boost. 2) Slowly read through the information and attempt to retain as much as possible. There are many methods and practices introduced in The Power of Less, and if you can retain it all, by all means, do so.Â Keep in mind this is not a novel and all of the information is important to the result.Â Even if you can retain everything contained within, it is probably not a bad idea to keep it handy, just in case. This book is divided into two parts.Â Section 1, the Principles is the “what” and “why” of the book.Â Six sub-sections cover: Why less will yield more if done correctly, limiting yourself, simplification, focus, creating new habits and how to begin with a low failure rate. I absolutely refuse to give away Leo’s methods specifically.Â I will however, say that putting these principals into practice WILL help you become more productive with less effort.Â Adjusting and changing your habits until they yield the best possible results are stressed, and new methods are introduced to help you adjust to the changes and get even more done in the process.Â This section gives a glimpse of what the book is about and how to attain success through the power of less, but the real juices start flowing in the second section. This section starts with putting into practice the principals described in the previous section.Â Simple goals, simple projects and simple tasks are stressed in order to set the reader up for success.Â After all, if you start small and grow the small successes into larger ones, then this book is a complete success.Â Even though the eight chapters following the principals start with the word “simple”, make no mistake about it, the strategies may be “simple”, but the results are anything but.Â These sections are about simplifying, not being easy.Â Habits are hard to kill, as almost anyone would tell you.Â In Practice is about making your routines more productive, while doing less in the process.Â Eliminating all of the unnecessary, time-wasting and useless tasks that we inundate our daily lives with. Nearly all of the ideas brought fourth by Leo are applicable both in business (whatever you do) and at home.Â From removing clutter, to managing time, taking The Power of Less piece by piece and applying tactics throughout your life will bring about considerable positive change.Â I would loved to have gone chapter by chapter to review The Power of Less, but I would rather have each of my readers check it out for themselves.Â I believe this book can do amazing things for many of us, and it really is SIMPLE. 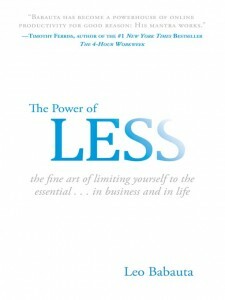 So that is that.Â My Glowing review of: The Power of Less by Leo Babauta. Read this book.Â If you can not read, get it as a gift for some disorganized, disheveled bum in your life.Â This book has produce notable changes in my life, and may do the same for you. Book Review: No Job? No Prob! Previous post: Shop For Gift Cards and Save!